Posted on June 19, 2017 by thelostlighthouse	in Gaming and tagged 5th Edition, adventure. D&D, desert, DnD, Dungeons & Dragons, fantasy, pen and paper RPG, role playing game, RPG, text based adventure, The Cursed Tomb, The Lost Lighthouse, TLL, tllgaming, Wizards of the Coast. ‪Bronan: At some point, Bronan is probably going to die attempting that, for now, any thoughts on our plans Constance or Faustus? Constance: I like the bolas thrower. A covered cart with one of us in it prepared to fire nets is good. One of us hidden elsewhere on a ridge or something is good. And one of us leading the cart. Constance: I’m happy to lead the cart. Put these poison darts to good use. Do we have any idea how many might be in a raiding party? Faustus: Yeah I’m game for all of this. Constance: What magicky goodness do you have now? Constance: Basically we want to hit them hard and fast and keep them grounded if possible. Faustus: I’ve just gone for a curing spell to be safe! Constance: That’s a good shout. Stick you out of sight on a ridge? Faustus: Can do. I’m all in for a rumble once they are grounded though. Constance: Yup. Keep as many alive as we can? ‪Bronan: Sounds like a plan! Constance: Are smoke bombs a thing we could purchase? DM: So you want a covered cart and horses (or camels?) to draw it, a net catapult, and a pile of nets and javelins? ‪Bronan: Yup, make it camels, they’re slower but won’t die on us as easy! Constance: Oil and fire yea. That works. Constance: And what does he expect in return? DM: The eradication of the bandit gang blessed wind. Kill their leader and scatter them, kill them all, or do whatever you choose. Constance: I can’t think of anything, but you know what it’s like packing! You always feel like you’ve forgotten something! Faustus: I think I’m good for anything else. DM: Anything else you three want to do before setting off? DM: There is also a very basic net launcher mounted on the covered wagon, with 10 nets coiled and ready to be shot. Loading it is a bonus action, firing an action. It has the same effect as a net but a range of 100ft! Constance: Where are we thinking of heading? Somewhere near the original site? Constance: Somewhere with a cliff would be good. ‪Bronan: There are mountains to the north of the ambush site, so north from there? Constance: Could be a shout. Find a place where Faustus can get hidden up high, reduces the efficacy of them flying out of range. DM: Bronan, roll me a d6? ‪Bronan: So I only get eaten by two sandworms? DM: If you are just carrying straight on? ‪Bronan: Bronan trying to pretend to be trader, trader not fight? DM: So yes, after you pass rib gulch and into the red plains, how are you proceeding? How are you acting/dressed etc? Constance: Faustus can head off to one side within viewing distance and try to remain unseen? DM: How far out is faustus? Faustus: Have we determined a good spot for me to spy from? ‪Bronan: Should we give Faustus more javelins? Faustus: So I’m going to be up on a ledge if we can find one, staying hidden until they attack and then I’m going to be throwing down javelins at some birdmen? Faustus: I’m off then. My cloak pulled over my armour and shield. Faustus: Can we see anything in the sky as we move? DM: Night is falling. Where are you setting up the wagon? By the tomb, away in the dunes and plains? Faustus: I’d guess not suspiciously close to either the tomb or the previous attack site? ‪Bronan: Hmm, we’ll need to build a good fire in case of night attack, I have no darkvision! Faustus: Haha neither do I! DM: Survival roll to see how much fuel you can find? DM: Nothing happens overnight. What are you doing? Constance: Heading to somewhere in between the tomb and the site of the original attack trying to find an easily defensible position. Constance: Ok, let’s head north, skirting around the original site towards those mountains. DM: Okay, Faustus, a d6 please! DM: Is the plan to continue ambling along until dusk and then camp up? ‪Bronan: I also got a 1, hopefully that 1 trend won’t continue in combat! ‪Bronan: Got an unnatural 20 on disadvantage, exact same roll! Constance: Hahaha. You think we have that little trust in you? 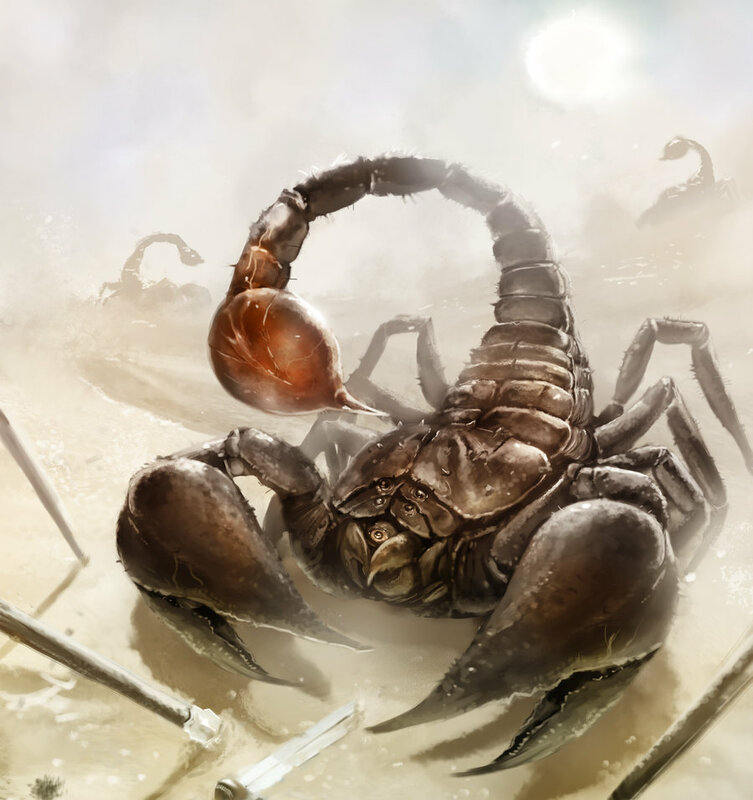 DM: And all of you notice that the rock walls of this path are covered in scorpions! Constance: Uh, can we turn around? ‪Bronan: Fuckballs, they are on the walls right? Or the floor? Constance: How many camels we got? Come back next Monday for Chapter 12 of The Cursed Tomb!